You can see the Accounting Software Integration panel if you scroll down on the lower right part of your projects dashboard. It allows the users to connect to various accounting websites that are supported by the Small Builders website which are MYOB, QuickBooks, and Xero. To have access to these, you must have first completed your Business Profile and Manage Contacts. You can customize the access settings to determine the users who can use them. 1. Click Access Settings to add or customize users who can or cannot access or view. 2. Click the Choose a user dropdown menu to search for users. Select the user that you want to give access to your accounting software. Accounting Software Integration User Access allows multiple user access. Click on the encircled '+' button to add more users. Click on the encircled 'x' button to delete. Click on the upper right 'x' button to close. There are three accounting websites, namely: (a) MYOB, (b) Quickbooks, and (c) Xero. 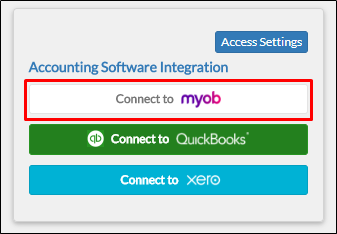 A. Click Connect to MYOB to configure your connection to MYOB. You will be redirected to MYOB Integration. Options under MYOB Integration include Contacts, Projects, Sales, Purchases and Timesheets. You can only access these options after connecting to your MYOB account. B. Click Connect to QuickBooks to configure your connection to QuickBooks. You will be redirected to QuickBooks Integration page. 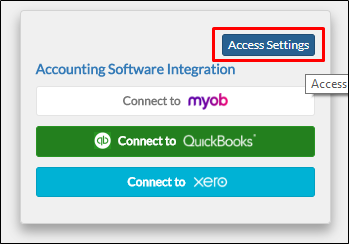 Options under MYOB Integration include Invoice, Expense Claims, and Timesheet. You can only access these options after connecting to your QuickBooks account. C. Click Connect to Xero to configure your connection to Xero. You will be redirected to Xero Integration page. Options under Xero Integration include Contacts, Sales, Purchases, and Timesheets. You can only access these options after connecting to your Xero account.